We love getting reviews and testimonials from our customers. We have just started this page to give our customers the chance of leaving an honest review about our plumbing and heating services. We welcome your honest opinion. Good reviews encourage us and less than good ones help us to identify weak areas in our business, so we can improve upon them. If you would like to leave us your honest review of our service, simply click here and you will be taken to a an easy to complete form. We would also love you to leave your review on Google and Yell. 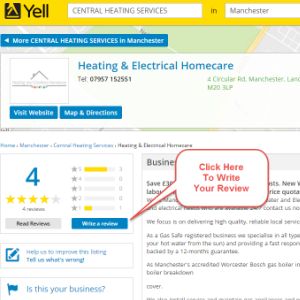 Just click on the images below and you will be taken to our business pages where you can quickly leave your review. A professional job was completed on time. 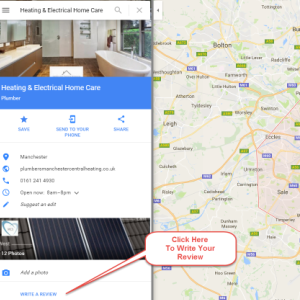 I’ve known Heating and Electrical Homecare for some time and can recommend them. They always follow through on what they promise and their work is of an extremely high standard. Superb – You would be wise to use them. They did me a spectacular job and cleaned up completely after themselves. Plus, they saved me £400 on the same job quoted by British Gas, but installed a better boiler than British Gas was offering, and over the next seven years they are saving me another £400+ because I don’t have to pay for ‘Boiler Cover Service Plan’. What more can anyone ask for? XYZ Company is rated 5/5 based on 3 reviews.